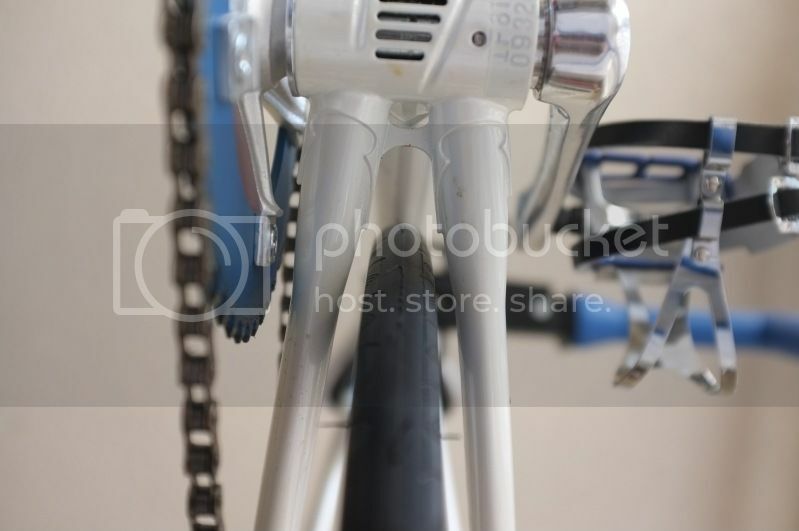 First, the wheel can't be centered between the chain stay and the seat stay. 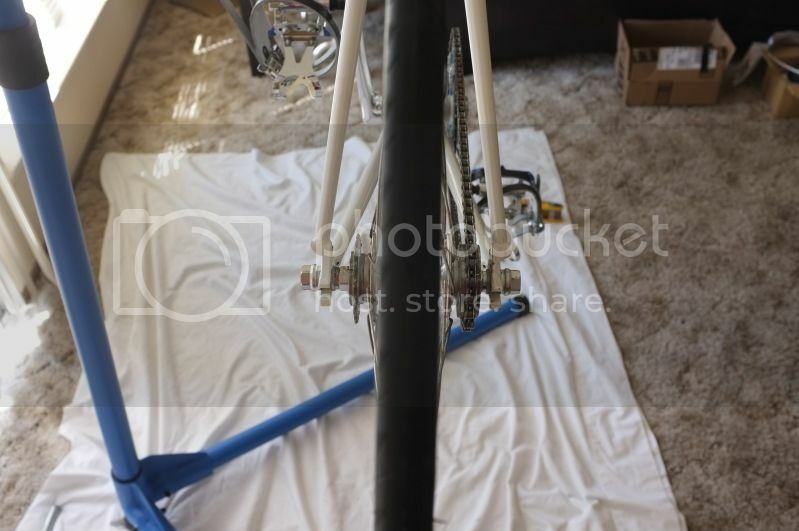 I flipped the bike upside down, and aligned the rear tire with the seat tube/BB and tightened the nuts. Now when the bike is right side up, I found that the space between the tire and rear forks (chain stay and seat stay areas) is not equal. Now, I have a digital caliper and it's a matter of mm. There may be 1-2 mm difference of space on one side. Now, is this a problem? Is there normal variation in frames? Will this affect the ride or the normal wear of components? I just want to see if this is an issue big enough to try and return the frame. I heard in other threads that Kilo TT frames are commonly variable in their fork/frame construction. So should I not worry too much? If pictures would help, let me know. Perhaps the wheel is not dished correctly. Put the wheel in backwards, with the cogs on the wrong side. Is it now off center the other direction ? When I first got bike I had a LBS true the wheels, which leads me to think that they are okay. I did try the above procedure, and yes it's off center in the other direction, just as slightly. Then although it is true (no wobble) it is not dished correctly. That means that the rim is not centered exactly between the locknuts. It's a simple fix. 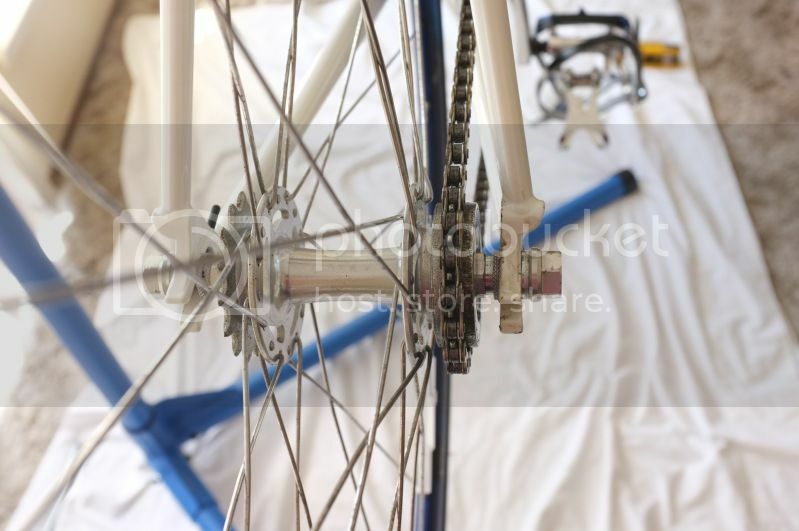 Spoke tension needs to be adjusted slightly to center the rim. The shop probably should have checked the dish when truing it. Or maybe they thought it was "close enough"
It's a single speed with track nuts - he can just move the axle over a smidge and leave the spokes alone. Last edited by DiabloScott; 08-31-12 at 10:30 AM. Yes, moving the axle will do the trick, but it isn't the axle itself, but the spacers between the lock nuts and bearings that count. The object is to change the shell to locknut distance. This only works on threaded axles where a spacer can be added to removed to change the shell to locknut distance. It may not work on many hubs with alloy prespaced axles. For thos a thin spacer can be added outside the locknut on one side but you'll lose the serration that has the locknut bite into the dropout and slippage can occur, especially if it's on the right side. So, 4 options I think (ok, just 3). 1) Get it dished. 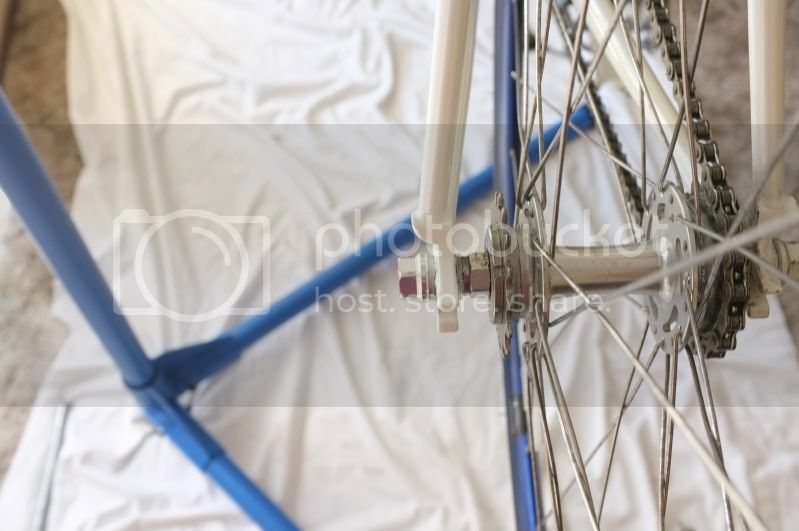 1/4 turn or so tighter of the spokes on the side that has the bigger gap to pull the rim over. 3) Say "good enough" and just ride it, as long as you have plenty of clearance between the tire & frame. Last edited by Homebrew01; 08-31-12 at 11:26 AM. Seems like it would be best practice to "un-dish" the wheel if that is in fact the problem -- if the OP were using a flip-flop hub, he'd need to futz with moving spacers around if he wanted to use the other cog. Last edited by ThermionicScott; 08-31-12 at 11:52 AM. Honestly I haven't responded because I know this is a little over my head and I don't want to get flamed. Anyway, I investigated further and I have pics included. I believe the frame is slightly off. Considering the following pics, would you say I should just stop being so picky? I checked the spacing and this is spot on: same distance between locknuts and shell. 2. Also, it wouldn't hurt to have the rear dropout alignment checked - 5 minute job. This will reduce dropout influenced wheel slip when tightening down the mounting nuts. I'm not trying to "band aid" things, but I don't KNOW for certain that the wheel NEEDS to be dished! Second, I don't have rear drop outs. It's a track bike, with rear fork ends and I've checked that those are aligned and to the best of my knowledge they are. reads like they did not, at the shop..
from the center line of the frame? ... would you say I should just stop being so picky? Probably, but, You are not alone, OCD gets expressed frequently, here. with dial indicators taking measurements . Last edited by fietsbob; 09-02-12 at 10:57 AM. If he has OCD, he should splurge on a dishing tool. I did try the above procedure, and yes it's off center in the other direction, just as slightly. When you flipped the wheel around and found that the offset was flipped as well that was total proof that the wheel isn't dished correctly. If it was anything else the amount of offset to the other side would not have been the same amount as the first way. Now if you flipped the wheel around and found that it was absolutely centered where it was offset as shown in your pictures then you'd have TWO things at play. One would be that the wheel wasn't perfectly dished and the other that the dropout stops were not quite absolutely square on. If you then zeroed out the dish in the wheel you'd find that there would still be a small amount of offset but that it would stay the same when the wheel was flipped. The remaining FIXED SIDE offset would be due to the dropout stops not being set identically. This, of course, assumes that your dropouts have the stop screws which you can set. Not all bikes have those. Now if you're using axle tugs and the offset switches when you flip the wheel then you really don't know if the issue is with the wheel dish or if the axle tugs are not set spot on since you flipped BOTH the wheel AND the axle tugs. When you switch two things you can't tell which of the two is the issue. And keep in mind that when you flip the wheel around to test this you're seeing DOUBLE the difference. The amount you need to pull the dish is only going to be half of the total difference from the flip. For more than a few shops 2mm is likely felt to be good enough. Or possibly they didn't do a last minute dish check. Either fine tune it yourself or take it back and ask for it to be zeroed out for dish. The key is in correctly interpreting what you see when you do such tests and what the test is designed to indicate. Just tighten each of your fixed side spokes a quarter turn. Start at the valve, work your way around. Then do it again. Should be about right. I'm not trying to "band aid" things, but I don't KNOW for certain that the wheel NEEDS to be dished! . You do know that you have to dish the wheel. You proved it to yourself when you flipped the wheel. That *is* the non-shop way of checking for proper dish. Since this is a SS/symmetrical wheel, it really shouldn't be dished. Very well then, the wheel needs to be "undished." Anyway, I went to a LBS and talked to the guy who trued my wheels. He said that in his opinion, it looks fine. I asked if he thought we should take the wheels off and use a dish stick to check and he didn't think so. He looked closely at my bike all the way through, and felt it was properly aligned. Incorrect, it has symmetrical dish... or should have. Also I should note that don't base your opinions off the assumption that I did the "acid test" (flip flopping the wheel) correctly. Honestly, I don't totally understand the test and the parameters so the "test" may not have actually showed that dishing the wheel is necessary. If you look below my signature, you'll see my quote that an ounce of diagnosis is worth a pound of cure. Don't fix anything (including dishing the wheel) without first confirming that it's the actual problem. The flip-flop in the frame is a rough indicator of a possible dish error, but that's all it is. Go buy 2 bottles of decent beer, then bring them and your wheel to a decent mechanic (leave the bike home) and ask that he check the wheel dish with a wheel dishing gauge. Agree with him in advance that if it needs dishing, you pay him to do that, but if it doesn't he gets the beers as a thank you. Once the wheel is dished, then you can eliminate that as a problem and if it's still off a bit, you can decide to live with it, or deal with the frame. 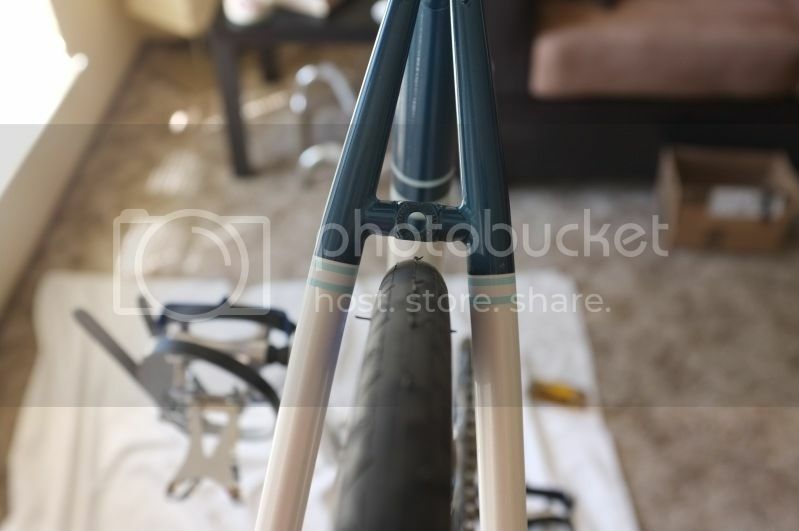 The frame could have one dropout (the top surface) higher than the other, which is fixable with a file, or could have the chainstays not squared up, or some combination of both. It's easy to misdiagnose the actual frame problem so I suggest that if the bike handles well (rides no hands without compensating) you leave it alone. BTW- I've seen perfectly aligned frames and perfectly dished wheels look like yours so unless you have a performance problem that you can identify (ie. always needs to be compensated slightly to the left) you leave it alone, since it's about whether it rides right, not whether it looks right that counts.